Objectives: To determine the functional outcome of open reduction and internal fixation (ORIF) in Danis-Weber type B ankle fractures. 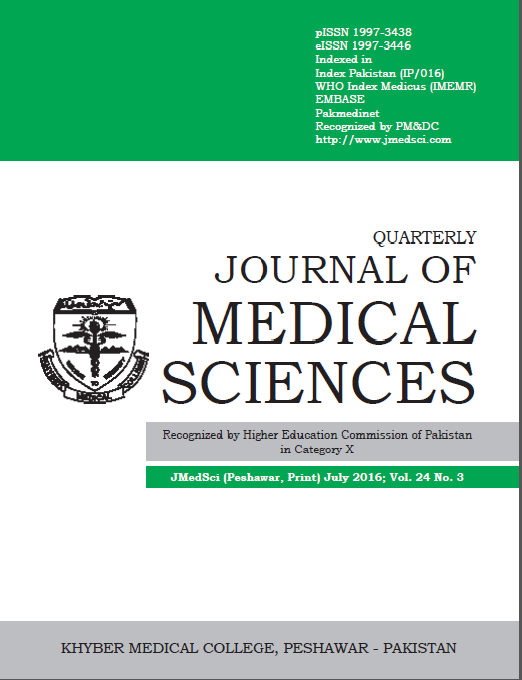 Material and Methods: This study was conducted at Department of Orthopaedics, Khyber Teaching Hospital, Peshawar from April 2015 to October 2015. Study design was descriptive case-series study and the duration of the study was 6 months in which a total of 145 patients were observed by using 60% proportion of no pain after using ORIF surgery with 8% margin of error and 95% confidence interval under WHO software. More over consecutive (Non-Probability) sampling technique was used for sample collection. Results: In the present study mean age was 40 years with SD ± 3.66. Sixty three percent patients were male and 37% patients were female. The status of pain was analyzed as 65% patients didn’t have pain, 20% patients had mild pain, 13% patients had moderate pain while 2% patients had severe pain. Conclusion: Surgical management of malleolar fractures of ankle is simple, effective and economical which can be carried out in a minimal basic orthopedic set up. It ensures restoration of anatomy and good function of the ankle joint.